Hello ladies! 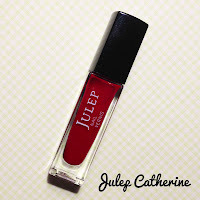 I have been fortunate enough to be part of Julep VIP program and they have been so kind to send me some products to review! As you can probably tell by the fact that most of my polishes are from Julep, they are one of my favorite nail polish brand. I think Julep makes up at least 75% of my collection thanks to the Julep Maven program, as well as some blogging opportunities. Anyways, Julep sent me three fabulous polishes, Catherine, Olivia, and Gayle. Each polish retail for $14+ on their website, US Sephora, and $17+ when you buy is from Canada Sephora. However, if you enroll in their Julep Maven nail polish subscription program, one of your perk is that you get 20% off their online store. Therefore each polish is reduced down to $11.20 or $4.99 when they have their monthly promotion! Although they are on the pricier end, they definitely host a lot of worthwhile promotions that will allow you to get more bang for your buck! "Julep Nail Color is “4-free” and does not contain formaldehyde, formaldehyde resin, toluene, or DBP. Our professional chip-resistant formulation is fast drying and highly pigmented. Julep nail color is a fun way to make the season’s latest shades accessible to everyone. And because we’ve tested our trend-setting toxin-free colors and products in over 100,000 manicures and pedicures in our parlors, we have a good idea of what works and what our clients love." Check out the swatches and my review after the jump! 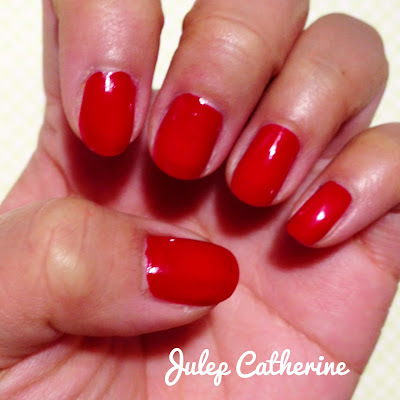 Catherine: The original classic, go-to red creme. To buy, click HERE. This polish is definitely a signature red. The picture above is only one coat, and as you can see it sufficient enough. The application is very smooth and even when it looks streaky, within seconds the polish spreads to create an even coating. My only negative is that the brush is a little bit frayed, which led me to believe that this is from an old batch from a couple months ago when they sent out a bunch of polishes with bad brushes. 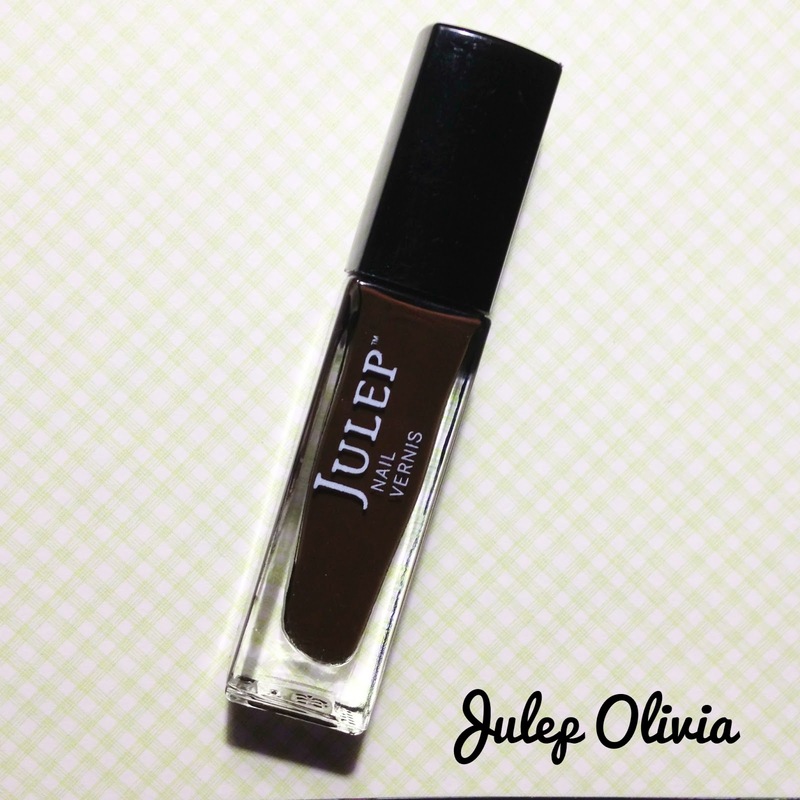 Fortunately, Julep is the type of company to nip the problem at its bud. So they sent out replacement brushes for those who asked for it, and sent out additional brushes in all their Maven's boxes during that month of occurrence. So if you ever have problems with your Julep polish, let them know as soon as possible and they will get it sorted it out for you! I'm not too sure if other polish companies are like that though. 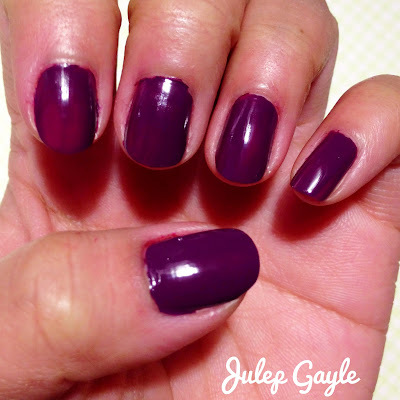 Gayle: Deep aubergine creme. To buy, click HERE. The picture above is also with one thin coat, but two coat would make it look more opaque. Again the application is smooth and easy to use. I love this color because I am obsessed with purple. Since winter is all about dark colors, this is perfect for this season! 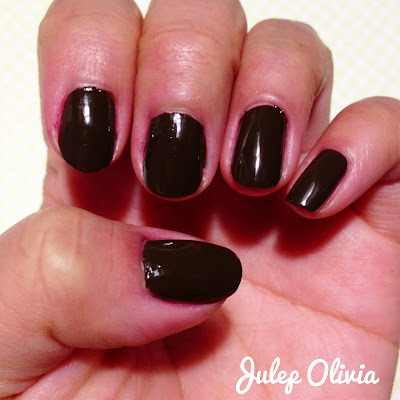 Olivia: Rich and graceful, dark chocolate truffle creme. To buy, click HERE. The image above took two coats just because the first coat still seemed a little translucent to me. In the picture it may look black, but it's actually a dark brown like the description states. I feel like brown is so understated, but it's such a beautiful color! I already have Olivia, so it's awesome that I can share this color with other people or put it in my future giveaway prize bag. There you have it, my three fabulous new additions to my Julep Collection! I hope you enjoy my review, stay tune for me! Hi Samantha! Awesome, you're a Maven too! Isn't it just so awesome to get these little fancy wrapped boxes in the mail every month? I just love the Julep program. a cause and raises awareness about an issue that you care about. December Julep Maven + My Polish Rack!